Discover your most flattering colour palette with our personal colour analysis consultation. The colours that make you look most alive and bring out your inner glow have a harmony of qualitites, and if you follow your swatch, you’ll be able to mix and match your entire wardrobe easily and without fuss. We’ll also teach you how to use existing pieces in your wardrobe that aren’t your colours, but still allow you to get wear from them without compromising your look. Many of our clients have previously had a colour analysis using a different system, but find that the colours don’t really work for them. When they have a colour analysis with Bespoke Image they feel that finally, they’ve found the right colours to wear. This system includes colour groups that don’t exist in other systems. Your colouring changes as you age, if you’ve had a colour analysis 10+ years ago, it’s probably time to have a new one. 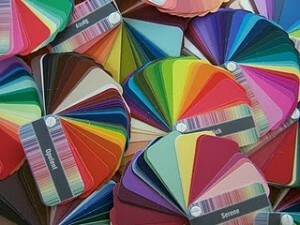 You can even use this colour system to help you develop a colour palette to decorate your house. Want to know more about what you’ll discover about yourself in a colour analysis and what we cover? Watch this short video. Wearing the best colours for you will make you look healthier, happier, vibrant and help you project a really positive image. Remember the last time someone commented on how well you looked? What were you wearing? You’ll probably find out that it was one of your best colours – book your colour analysis today so that those compliments keep on flowing. 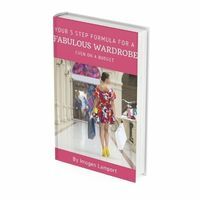 Just think about all the clothes you’ve bought over the years that either are worn once (not including your wedding attire) or never worn, and take up valuable wardrobe space – why is it that you don’t wear the item? Maybe it’s because the colour doesn’t suit you, and doesn’t make you feel good. A colour analysis is an investment in your future wardrobe, and an investment in you – if you look good, you’ll feel good, and will project a positive image that others will pick up on and reflect back to you. Men – you don’t get to wear makeup, and many men don’t colour their hair, so a colour analysis can really help you look your best. Wearing the colours that suit you will make you look more in control, vibrant and more youthful. You’ll save money as we’ll teach you how to mix and match colours so you get great value from your clothing, and make it easy to shop as you’ll have your handy swatch so you won’t make mistakes buying the wrong colours. Your swatch is a great tool to help cut through the vast clothing choices and head in the right direction. Women – Your Colour Analysis session also includes a Makeup Update session (valued at $150) – which includes a makeup lesson and application, using only colours that really bring out your best features. All makeup used is available for purchase. The “What Not To Wear” series on TV whetted my appetite for my own personal image consultant. 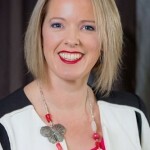 Imogen Lamport’s web page advertising her services and products made it easy for me to contact her and arrange a consultation on a recent trip to Melbourne. Imogen visited me for a Colour Analysis and Makeup Update. She made up half my face and had me do the other half. This was a great idea as it gave me the confidence to use more makeup than I normally would and in colours that suited my skin tone. She also suggested changing my hair colour as the highlights I’d just paid a fortune for did not suit my colouring. During our shopping trip Imogen chose styles and colours I’d never worn before. The comments I’ve since received on how well I look has made me realise I’d rarely received any when wearing my usual black business outfits. My first job when returning home was to evaluate my wardrobe, and I now find I can get by on a lot less clothes because everything mixes and matches. Imogen, you offer a wonderful service in that you know just “what not to wear”. Thank you for my makeover, and giving me the confidence to step out of my comfort zone in choosing new clothing. I look forward to another shopping trip when next in in Melbourne. Helen – Accountant, over 60 and loving it. Individual Colour Analysis takes 1.5-2 hours and costs $380 – this includes your personal swatch to take home and use when shopping plus a set of comprehensive colour notes to help you to best wear your colours. In your individual colour analysis you’ll learn your very best colours, and how to wear colours you already own, that aren’t your best, but you can’t justify getting rid of the item just yet. Make-up will also be updated to reflect your new colours, as well as advice on which hair colours will suit you best. Groups of 2-4 takes 3-4 hours and costs $300 per person. A fun session with your friends or colleagues – you will be able to compare your colours to others, and see just how most people are different, and how personality also affects the colours you wear and look best on you. Shown your best neutral colours which are the basis of your wardrobe. You will be provided with comprehensive notes on your colours and how to wear them to best effect. Notes include best metals, glasses colours, investment pieces, contrast, combining colours, psychology of colour and hair colouring. Thank you, thank you, thank you. I had my colours done when I was a girl and found that I was a ‘winter’. I had great fun wearing those ’80’s colours (bottle green, Schaiparelli pink, royal blue etc), but lately I haven’t felt like wearing those colours anymore. Finding out my ‘new’ colours(and that I don’t have to wear black) has given me so much more choice – especially in the ‘neutral’ end of the range. I feel so much more alive, I feel like I’m a real person again – people ‘see’ me. I ‘see’ me. Knowing the colours that suit me has given me the freedom to spend much more time deciding whether I like the cut and line of the clothes, and whether they actually suit me. It’s given me permission to go blonde; last time I tried it, people looked straight past me, but this time, I’ve got a blonde colour that suits me, and with the right colours, I’m still seen as a smart, capable woman. I’m looking forward to going back to work and shopping for new work clothes that I like, rather than those that will ‘give me authority’ on the building site. Even better, as a mum of two toddlers staying at home for the next year or two, I’m looking forward to buying new winter clothes that aren’t the ‘regulation’ black tracksuit pants that I’ve been wearing for the last two years. Yes they were comfortable, but black really shows up the spew!